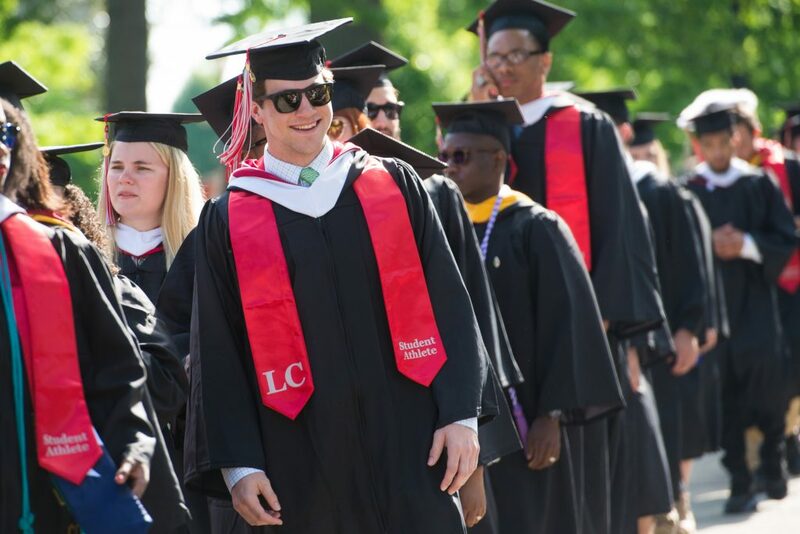 Graduates in University of Lynchburg’s Class of 2018 celebrated Commencement Saturday with a nod to the past and a look forward to their future. More than 730 graduates participated — about 420 undergraduates and 310 doctoral and master’s degree students. Before they received their diplomas, Alumni Association Board Chair David Rosser ’90 talked about the alumni in whose footsteps the graduates would walk. He invited the graduates to connect with other alumni for friendship and career networking. “You are not alone in this next chapter of life,” Rosser said. 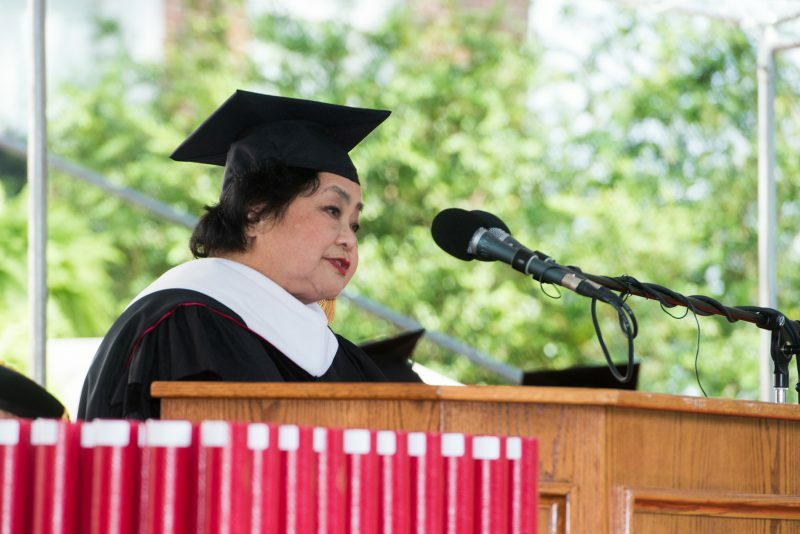 Commencement speaker Setsuko Nakamura Thurlow ’55 remarked on the mixed emotions new graduates might experience. “Your hearts must be filled with an overwhelming sense of joy and pride for your accomplishment, … and yet you must feel a sense of uncertainty as well as you begin a new chapter of your life’s journey with yourself as your own guide,” she said. That’s how she felt 64 years ago when she graduated from a university in Hiroshima, Japan. Shortly afterward, a University of Lynchburg professor she met at a conference arranged a scholarship so she could study sociology at Lynchburg. 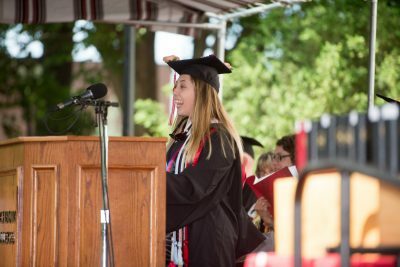 Senior class president Sara Severens ’18 spoke about some of the experiences that defined her University of Lynchburg experience. She noted that there is a lot of change coming to campus — a new name and a new residence hall, for example. She asked her classmates to think about the multitude of aspects that will not change. “As our beloved school transitions to become the University of Lynchburg over the summer, … I encourage every one of you to remember the people that I hope made you fall in love with this school as much as I have,” she said. “Lynchburg is not about a name, or new buildings, or rebranding, or a restructure. It is about the people that make up every classroom, department, staff, team, and club on this campus. … I love Lynchburg, and I know that when we visit in five, 10, or 20 years, it will still be the connections that I formed with people that will be the most present in my mind. “As we, the last class of University of Lynchburg, move into the next phase of our lives, our school will be growing with us. but just like Lynchburg helped to form the essence of who we are, its values and impact on the students who come here will not ever change. Check out photos in the Commencement album on Flickr. Commencement received coverage in The News & Advance and WSET. NHK News, a public television station in Japan, covered the Commencement activities published stories in English and Japanese. WSET and WSLS also interviewed Commencement speaker Setsuko Thurlow.